Clean and cut up chicken. Wash, let dry. Peel and dice onion, potato, carrot, garlic and sweet pepper. hours for seasoning to soak in. Add oil to a large Dutch or heavy-bottomed pot. Turn stove to med. high. Remove all the chopped vegetables from chicken and set aside. Place chicken in hot oil and stir briefly so that the oil coats all the pieces of chicken. Continue to braise the chicken, turning often until each piece is nicely browned. 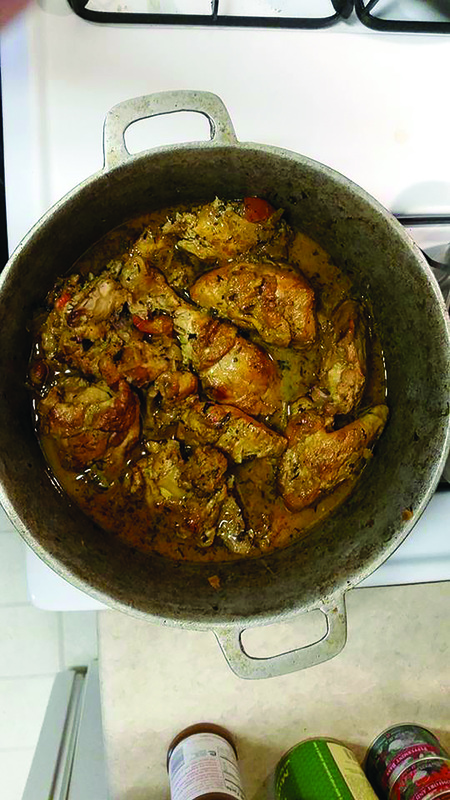 Add 1 to 1 ½ cups water to the pan, cover and steam until the water that springs from the chicken evaporates and there’s only oil left in the pan. This will take about 20 mins. but watch closely. If you hear a sizzling in the pan it is likely ready for the next step. Add the reserved chopped vegetables, 1 cup water and ketchup. Cook briefly until the vegetables are tender and the gravy is of a smooth consistency. Add half of the reserved oven roasted vegetables and heat through. Use the remainder of the roasted vegetables for garnish.